Tommia Dean and other cheerleaders were known as the "Kennesaw Five." Tommia Dean, a former cheerleader at Kennesaw State University, is suing the school and elected officials for violating her right to protest by “taking a knee” at a football game last year. 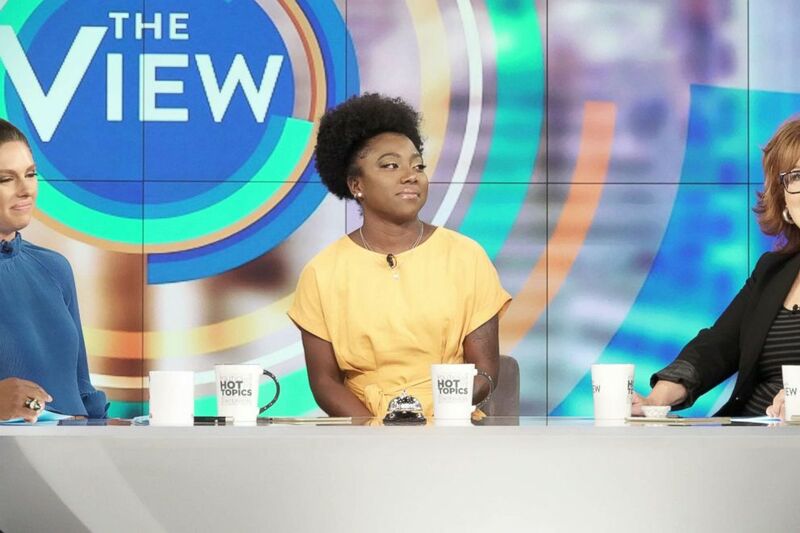 (ABC News) Tommia Dean joined "The View" today to discuss why she believes officials tried to stop the protest. The 20-year-old filed a complaint against former KSU President Sam Olens, Cobb County Sheriff Neil Warren, and retiring state Rep. Earl Ehrhart for emotional distress over violation of her First Amendment rights. She told “The View” that her distress manifested in a very physical way — often feeling "worried" and "constantly on edge" wondering, "OK, is something going to happen to me now?" “You just don’t really know how to take it but it does add stress onto your life,” Dean added. The stress exacerbated her “severe” migraines — a condition she has dealt with her whole life — forcing her to obtain a stronger medication, she said. “That could have easily been one of my brothers or one of my friend's brothers. You don't know who could be next,” she said. In fact, Dean has an uncle in the military, and she said she sees serving in the military as “honorable." Dean said his comments about her and her teammates were “nasty.” The Atlanta Journal-Constitution reported that before their next game, KSU decided the cheerleaders would no longer be on the field while the national anthem played. All five women who knelt tried out for the KSU cheerleading squad the following season, but only one was picked. 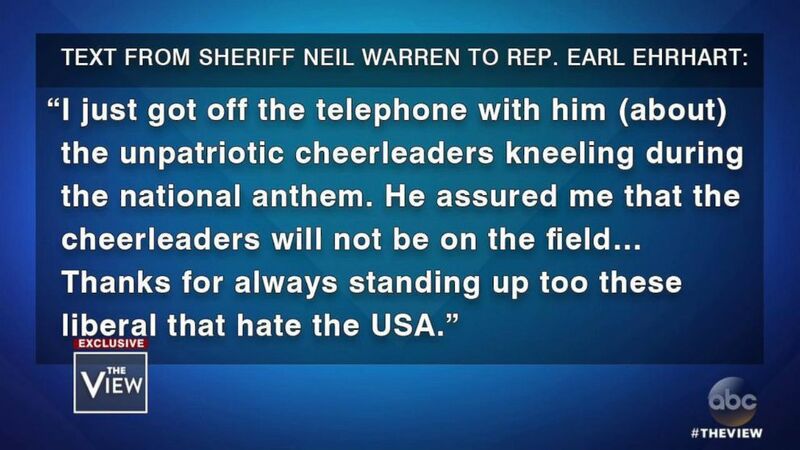 In October 2017, The Atlanta Journal-Constitution obtained text messages between Sherriff Warren and state Rep. Earl Ehrhart that told a different story. 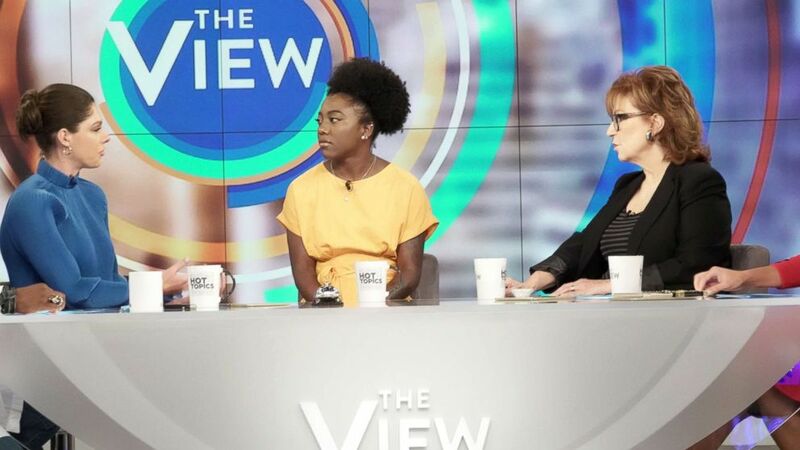 Dean’s mother, Nichole Dean, joined her daughter on “The View” and spoke about witnessing her daughter stand up for her beliefs. Neither Ehrhart nor Warren responded to requests for comment, though a spokesman for Warren told The Atlanta Journal-Constitution they would not comment on pending litigation. A spokesperson for KSU also told “The View” they were unable to comment for similar reasons. An attorney for Ehrhart said in a statement that his client did not act with racial bias against Dean or the other cheerleaders. Tommia Dean told “The View” that she looks forward to when people can have “an open conversation” about “taking a knee."